Deakin researchers have shown that taste sensitivity to carbohydrates increases intakes of energy and carbohydrates, and leads to a larger waist measurement. Deakin scientists have identified a potential seventh "taste" – carbohydrate – and are working to uncover how it's linked to consumption of starchy foods. Researchers from Deakin University's Centre of Advanced Sensory Science (CASS) have shown that taste sensitivity to carbohydrates increases intakes of energy and carbohydrates, and leads to a larger waist measurement. 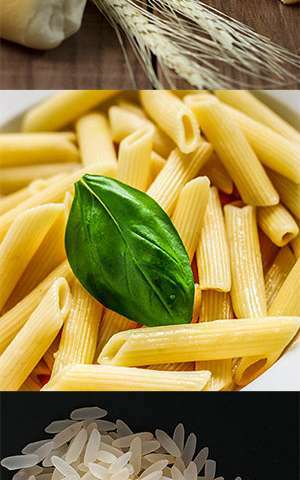 Lead researcher Professor Russell Keast said carbohydrates had long been assumed invisible to taste. "It's typically sugar, with its hedonically pleasing sweet taste, that is the most sought after carbohydrate," Professor Keast said. "But our research has shown that there is a perceivable taste quality elicited by other carbohydrates independent of sweet taste." Professor Keast's research looked at two carbohydrates, maltodextrin and oligofructose, both found in common foods like bread, pasta and rice. Initial testing by Dr Julia Low, an academic in Deakin's School of Exercise and Nutrition Sciences, showed that these carbohydrates could be sensed in the mouth. CASS researchers then undertook a study to examine whether sensitivity to the carbohydrates was linked to people's consumption of starchy foods. The study, – published in the Journal of Nutrition, looked at 34 adults and found significant correlations between how sensitive someone was to these carbohydrates, their dietary intake of carbohydrates, the amount of energy they ate, and their waist measurement. "Those who were most sensitive to the carbohydrate taste ate more of these foods and had a larger waist," Dr Low said. "We specifically looked at waist measurements as they are a good measure of the risk of dietary related diseases." Professor Keast said this line of novel tastes research was important because the increasing problem of dietary-related chronic illnesses, such as obesity, required a greater understanding of the drivers of the food we consume. "Increased energy intake, in particular greater intakes of energy-dense foods, is thought to be one of the major contributors to the global rise of overweight and obesity, and carbohydrates represent a major source of energy in our diet," he said. Professor Keast's team previously named fat as the "sixth taste." The fat taste studies explored the tongue's ability to detect fat as a distinct taste similar to people's ability to sense sweet, sour, bitter, salty and umami – the five traditional or classic tastes. "Interestingly, what we found in the fat taste studies was that the people who were more sensitive to fat consumed less fatty foods, but it's the other way around for carbohydrates," Professor Keast said. "What that could mean is that individuals who are more sensitive to the 'taste' of carbohydrate also have some form of subconscious accelerator that increases carbohydrate or starchy food consumption. But we need to do much more research to identify the reason why."